MÉSOPEPTIDE takes inspiration from two complementary aesthetic techniques to restore the décolleté’s youthful appearance. Infused with a cocktail of hyaluronic acids, peptide and vitamin C derivative, this emulsion acts upon application to hydrate, unify and smooth the skin. In 1 month*, the appearance of dark spots is visibly reduced and skin is smoothed and replenished with moisture. *Satisfaction test on 24 women, twice-daily use. *Satisfaction test conducted on 24 women after the 1st application. *Satisfaction test conducted on 24 women after twice-daily application for 28 days. 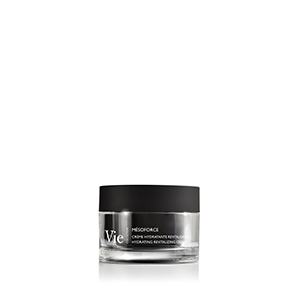 MÉSOPEPTIDE combines the comfort of a cream with the tensing power of a gel and melts into the skin, leaving an ultra-soft finish. Its formula is enriched with light reflective pearlescent agents for an immediate enhancing effect. An energizing scent with tangy notes of citrus fruit softened by feminine jasmine.